We’re not saying that there’s a magical formula for wealth, but there are several everyday habits that are very common among the super-rich. From waking up at the right time to organizing their schedules and staying healthy, these successful people have certain cornerstones of their daily routines that are surprisingly simple to pick up. Here are some anyone can adopt into their daily lives. Sorry night owls, but research shows that the world’s wealthiest people get out of bed early. A significant proportion (44%) of the rich wake up three or more hours before the start of the working day, compared to just 3% of the poor. That’s according to a book by Thomas Corley, Rich Habits – The Daily Success Habits of Wealthy Individuals. Corley interviewed 233 ‘rich’ people (whose income was over $160,000) and 128 ‘poor’ people (whose income was below $35,000) to get his results. How early should you get up? It’s hard to pinpoint the perfect time, as habits differ across the board. Apple’s CEO Tim Cook wakes up at an eye-watering 3.45am each day, whereas Richard Branson and Twitter CEO Jack Dorsey wake up at a (slightly) more reasonable 5am. This is one of the simplest habits to get into – and arguably one of the most effective. Corley’s research found that 81% of the rich maintain a to-do list compared with just 19% of the poor, which was associated with the ability to break down tasks and prioritize, in order to accomplish a wider goal. Richard Branson has sung the praises of list-making, citing it as the main reason for his success. He carries a pen and notepad at all times, believing “It doesn’t matter how you record your notes – as long as you do. When inspiration calls, you’ve got to capture it”. Bill Gates has also been known to take entire weeks out to go on “Think Weeks”, where he goes to stay in a secluded woodland cottage for seven days, purely for the purpose of thinking. It’s thought that one such week resulted in the plans for Microsoft’s Tablet PC. Another habit that’s dramatically more common among the super-rich is reading. Corley’s research found that 88% of the rich read 30 minutes or more each day for education or career reasons, versus just 2% of the poor. As already mentioned, Warren Buffett is a huge advocate of the benefits of reading, reportedly spending around 80% of his day engrossed in books. Meanwhile, Bill Gates hits a slightly more achievable pace of one book a week and Mark Zuckerberg aims to read one book every two weeks. If there’s one thing that will increase the efficiency of your life, it’s not wasting time on small decisions, which is why many of the super-rich are known for their strict routines. Mark Zuckerberg famously wears a uniform of gray T-shirts and jeans, a decision which he explained at a Q&A with the following response: "I feel like I'm not doing my job if I'm spending any of my energy on things that are silly or frivolous about my life." Other members of the super-rich have been known for their signature looks. Steve Jobs used to wear a black turtleneck and jeans, while Karl Lagerfeld opted for a black suit, white collars and sunglasses. According to TV show host Tim Ferriss, who has interviewed more than 200 rich and highly-successful people, the most consistent habit among them was meditation. “More than 80% of the world-class performers I interviewed shared this trait”, he wrote for Mission.org. Oprah Winfrey, Arianna Huffington, Salesforce CEO Marc Benioff and LinkedIn CEO Jeff Weiner all swear by meditation and use it in their daily lives. “Meditation, more than anything in my life, was the biggest ingredient of whatever success I’ve had”, Ray Dalio, founder of Bridgewater Associates, told The Huffington Post. Health is wealth, or so the old adage goes, but it might take on a more literal meaning when it comes to the super-rich. Exercise is one of the most common habits among very wealthy people, with millionaires spending on average nearly six hours a week exercising, compared to the average American’s 2½ hours a week. 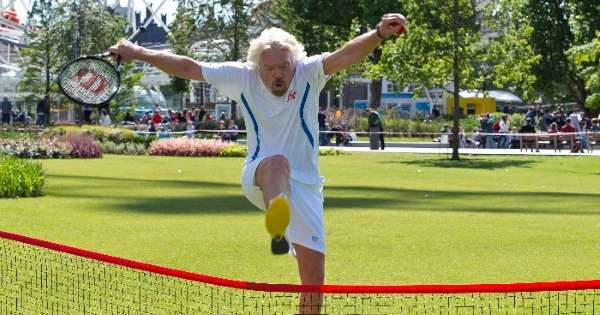 Richard Branson is a keen advocate for daily activity, waking up early to kite surf, swim or play tennis – he claims to get an extra four hours of productivity every day from exercise. Meanwhile Apple CEO Tim Cook hits the gym every day at 4.30am and Vogue Editor-in-Chief Anna Wintour plays tennis every morning. Yet healthy lifestyles don’t come naturally to all: Warren Buffett has admitted to CNBC that in 2007 he was given a choice by his doctor: “Either you eat better or you exercise”. He chose exercise, feeling it was the “lesser of the two evils”.